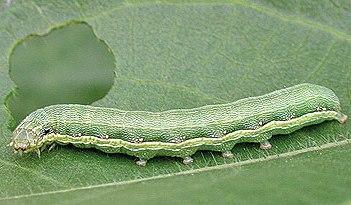 Region: This Caterpillar can be found throughout North America. Life cycle: This insect produces up to six generations each year. The adult moths migrate south in the winter. Physical Description: The 1 to 2 inch long caterpillars are green with a yellow underside and dark green and yellow stripes. The adult moth is gray with two yellow marks near the centers of the fore wings. The moths are night flyers and have a wingspan of about 1 inch. The eggs are laid on bark in large numbers and covered with hair. Feeding characteristics: This pest will attack beet, corn, pea, pepper, spinach, and tomato plants. They will chew the foliage and buds. They like to travel in large group and can be very destructive. Controls: The Trichogramma Wasps and Spined Soldier Bug are natural predators and can help to control populations. Handpicking is most often an adequate means of control, but for serious infestations, use an application of Bacillus thuringiensis. Dusting with sabadilla is effective against this pest, but only as a last resort.